After securing their passage to the second round with a 2-0 win over Chile, Arjen Robben praised his manager Louis Van Gaal in an unusual manner. The Bayern Munich winger has been in sparkling form for the Dutch as they topped their pool to set up a round 16 clash with Mexico. Few expected the Dutch to mount a challenge in Brazil with a relatively inexperienced backline, but they have been one of the teams of the tournament and Van Gaal has been credited with getting the most from his group of players. 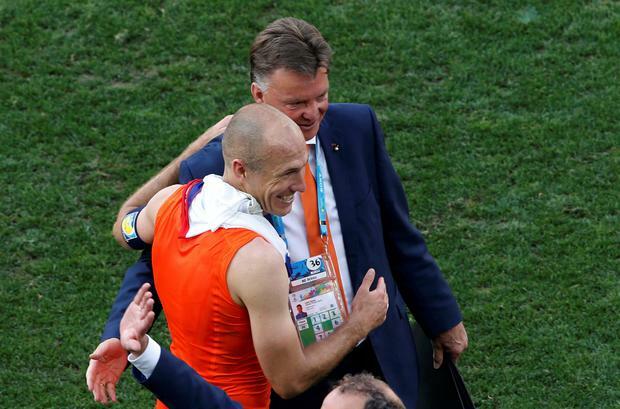 Following their 2-0 win over Chile Robben said that not only is Van Gaal a talented manager, but he is also a fortunate one. "Maybe Louis does have a golden willy," he replied smiling when asked about the impact of Van Gaal's substitutes after both Leroy Fer and Memphis Depay scored after their introductions. Robben has been linked with following his national manager to Old Trafford this summer and former Manchester nder Rio Ferdinand lamented at the weekend that the club did not sign the player when he was younger. “He had a brilliant breakthrough season with PSV in 2002-03, a campaign in which he turned 19, and Sir Alex Ferguson wanted to sign him. “United made a bid of something around £5m and Sir Alex was always determined he wouldn’t over-pay for any player.